Walter H. Bowart writes, "I had heard of the Sufi Samuel L. Lewis a long while before I met him. He had been described to me by a not-so-reliable source as an old man who went after young chicks, and "got them all hooked on dervish dancing." I'd not passed judgment based on a rumor, but wondered how a man in America who called himself a Sufi, could actually be one. It would be like a man calling himself "pure"; a pure man probably would not do such a thing. More than a year later I met two disciples of "Sufi Sam"-otherwise known as Sufi Ahmed Murad Chisti in Sufi circles of Pakistan, India, and Egypt, or as He Kwang in the circles of Zen Roshis. I was greatly impressed by their bearing and thus was led to a meeting with the man himself. His rhythm was that of a man who'd started falling forward and had to run to keep from landing on his face. He would get wound up in the morning after certain spiritual exercises and virtually fly through his days. - from the Forward written in the book, This is the New Age in Person (1972) by Samuel L. Lewis. May Beloved send His infinite divine love to Murshid Sam's soul. May Murshid's mystic smile behind the curtain bless us all who chance upon here. :: A Sketch of the Life of Murshid Samuel Lewis (Sufi Ahmed Murad Chisti; Sufi SAM) 1896 - 1971.
. You may watch a short video clip of Murshid Sam dancing his dervish dancing. 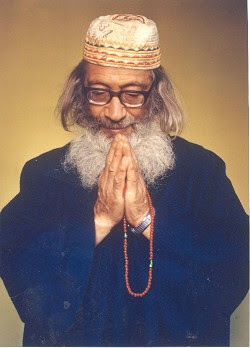 This is a man who with sacred dance and sufi zikr beckoned young people (hippies) from ecstasy of drugs to ecstasy of divine remembrance in the turbulent time of sixties.